I read this article and found it very interesting, thought it might be something for you. The article is called Government Expenditure On Education and is located at https://archive.indiaspend.com/viznomics/government-expenditure-on-education-23785. Every year, India spends $90 billion on education. About 35% of this or $31 billion is the Government’s share. The private sector spends around $50 billion. 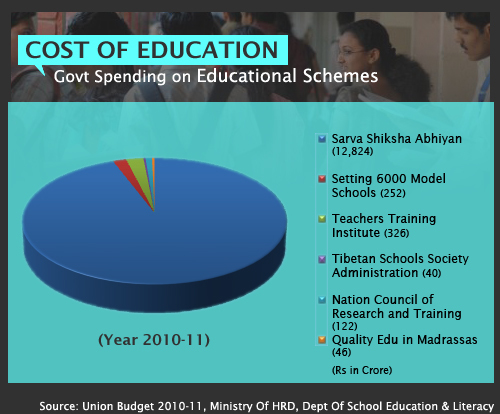 Here’s a snap shot of some general central government education spend figures for 2010 for areas (Tibet, Madrassas) you may not have heard of but would be interested to know.